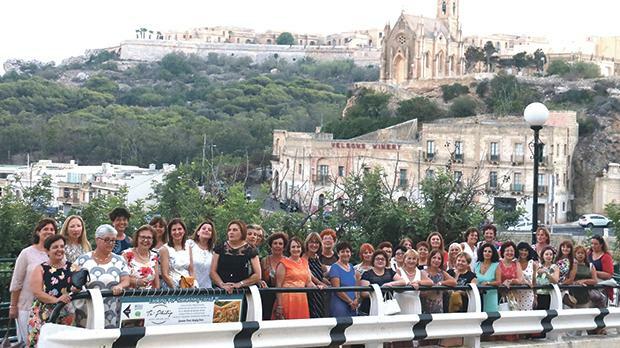 A grand reunion for girls born in 1960 and who were together at St Mary’s Grammar School in Victoria was organised by Nataline Vella (née Scicluna) following a chat she put together on Facebook. The evening started with Mass at St Anthony church in Għajnsielem, followed by a lavish buffet on the roof-top of the Grand Hotel. A splendid time was had by all. The evening was all about things that mattered: generosity of spirit, boundless gratitude and love. Attending the reunion were Marthese Caruana, Catherine Formosa, Melina Dimech, Lina Mizzi, Vicky Grech, Sunta Bonnici, Joyce Scerri, Carmen Sammut, Marie Louise Mercieca, Rita Camilleri, Maria Aquilina, Maria Frendo, Anna Grech, Antoinette Saliba, Maria Grima, Pauline Falzon, Maria Debono, Georgina Tabone, Joyce Spiteri, Yvonne Galea, Elizabeth Pace, Jennifer Hili, Rita Agius, Doreen Bugeja, Bernardette Theuma, Petrina Camenzuli, Loreta Theuma, Micheline Cutajar, Frances Grech, Joanne Grech, Maria Finger, Marlene Muscat, Rosabelle Pavia, Doreen Mercieca, Doris Abela, Annette Galea Scicluna, Nataline Vella, Anna Scicluna, Grace Calleja, Emily Saliba, Carmen Dimech, Carmen Saliba and Annie Buttigieg.